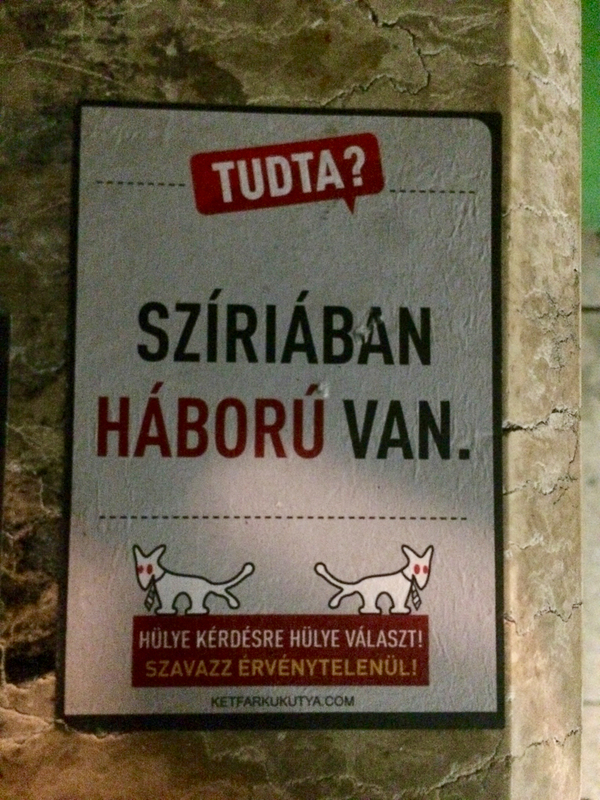 The Hungarian referendum tested not only my nerves but also the stamina of Hungarians. What did we have to withstand since the announcement of the referendum? 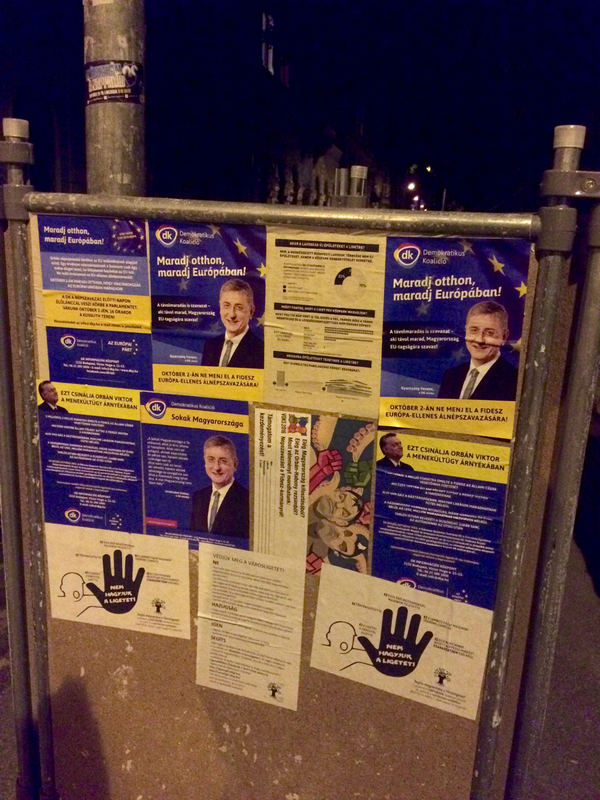 Let me walk you through the five months of the campaign as I experienced it here in Hungary. I heard about the referendum for the first time. I see the first billboards with sending the message to Brussels. I write an article about the strange referendum question and the campaign. Date for the referendum is announced: October 2, 2016. A new wave of blue billboards with questionable texts appears. Olympic Games create an extra opportunity to launch campaign spots. They are all over public TV. 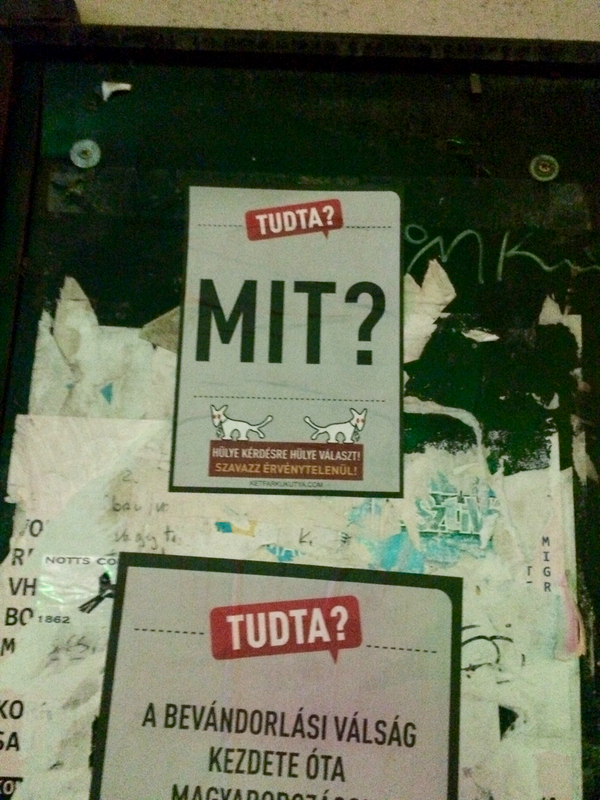 Reaction campaign of Two-tailed dog party (MKKP) starts, crowd sourced by Hungarians. I had sincerely a good laugh on the slogans. Did you know that life is beautiful? 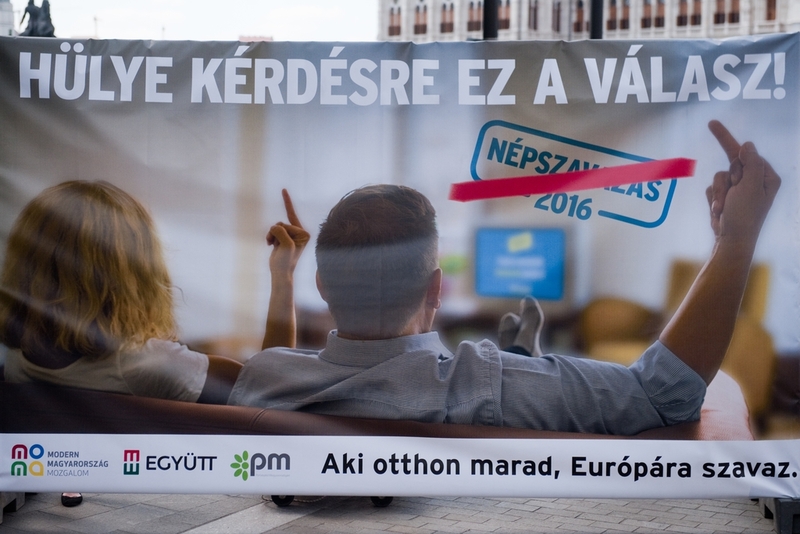 Billboards with Hungarian flag and a slogan “Let’s not risk it, vote no” pop up everywhere and replace the blue ones. It is not exceptional to see a defaced billboard. 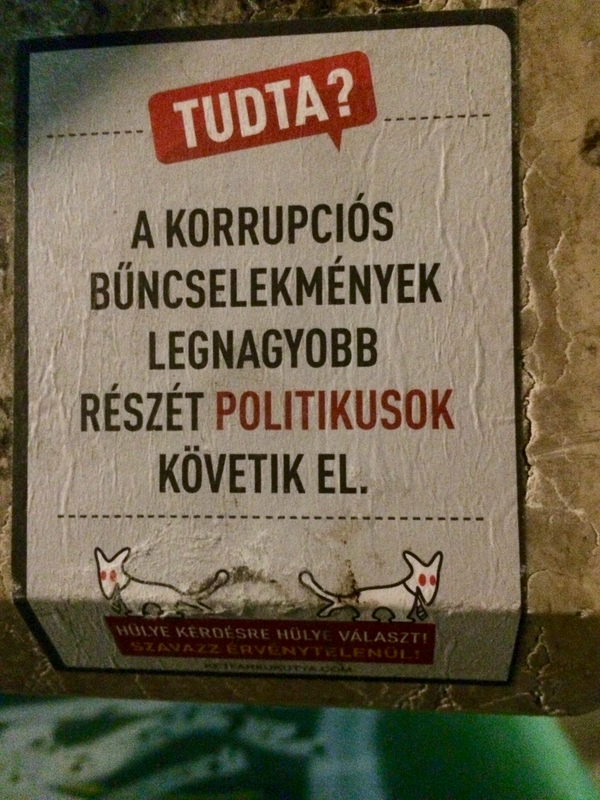 Dubious booklet arrives to the majority of Hungarian households, including mine (English translation of it here), National Election committee prohibits its further distribution. Peter Szijjarto’s fun interview in BBC about No-go zones in London (watch it, it’s hilarious). Opposition campaigns too. Campaign of Two-tailed dog party continues. F.Lackó makes a hip hop song to make people go vote “no”. Frankly, this has been the last drop for me. Look at what Merkel did to Germany. Look at the news on Facebook by yourself. Are you afraid for your family? Then vote No! We already have enough problems, let’s vote No. Let’s not risk anything, let’s vote No. immigrants do not consider us their friends. they blow up schools, they are all monsters. Violent, crazy people, they like to steal, not to work. at least three of them at the same time. What would you say if it happened to you too? Let’s rather make everything so that it does not happen. Here the voice of the people decides and nobody can oppose it. On October 2nd, let’s vote No. This is a short timeline of the referendum campaign as I witnessed it. 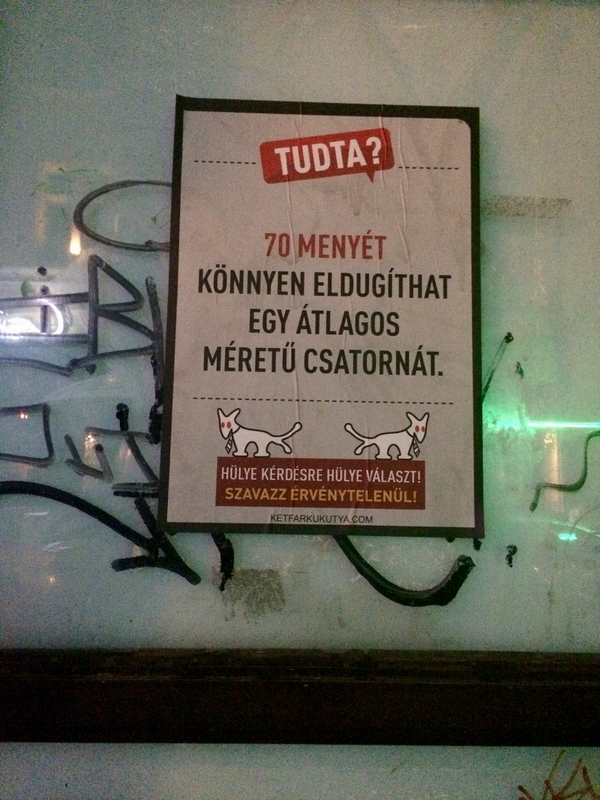 To be honest, I have never seen in my life such a massive governmental campaign although I come from the Czech Republic where politicians believe in the power of the billboard, too. And to be frank, I am very surprised how the Hungarians are brave to withstand such a massage. 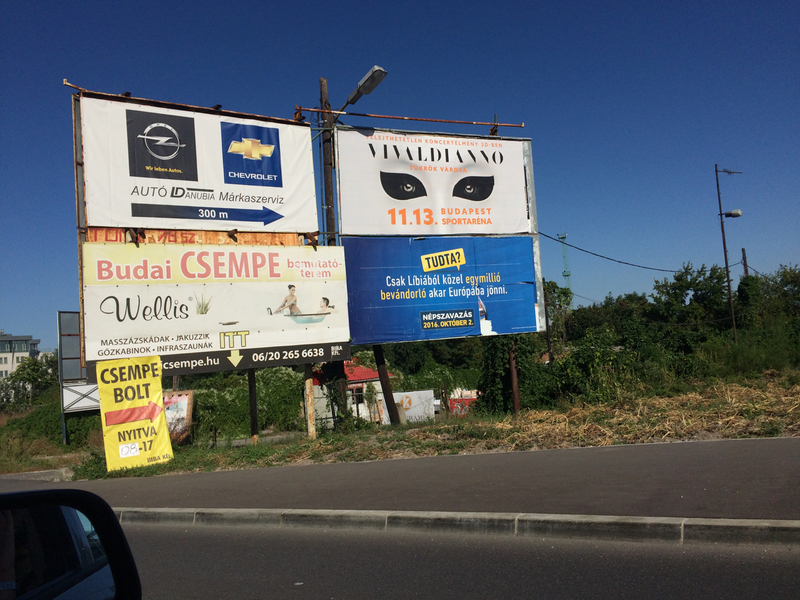 Every billboard that I saw when driving around Hungary in the past five months is just a sad reminder of how the governments waste public money. Nobody knows what will exactly happen after they vote “no” in the referendum. Although the campaign lasted five months, and cost more than an average Hungarian would earn in a lifetime, the people were never really explained what is the next step. The opposition is very fragmented because there is not a unified voice saying: “Stay home, don’t vote!”, the advice differs from voting yes, invalid or not going to vote at all. It seems that the referendum results might have some unexpected consequences (read about this here). 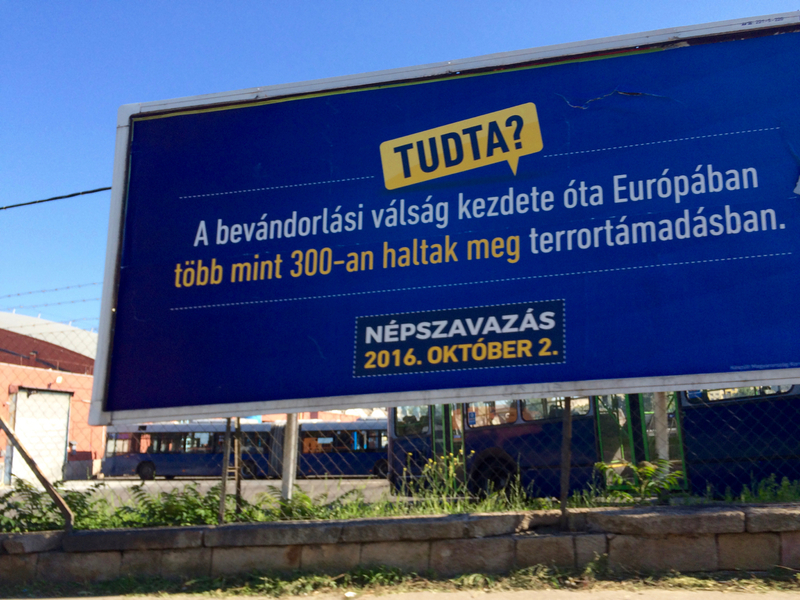 The governmental campaign was massive, I counted around 40 billboards on the way from the Parliament to the M1 exit in Budaörs. They were also on street lights, and on the buses. The Hungarians living abroad can also vote. The number of Hungarians living abroad and new Hungarians (i.e. freshly granted citizenship) has risen. How will this mix the deck? 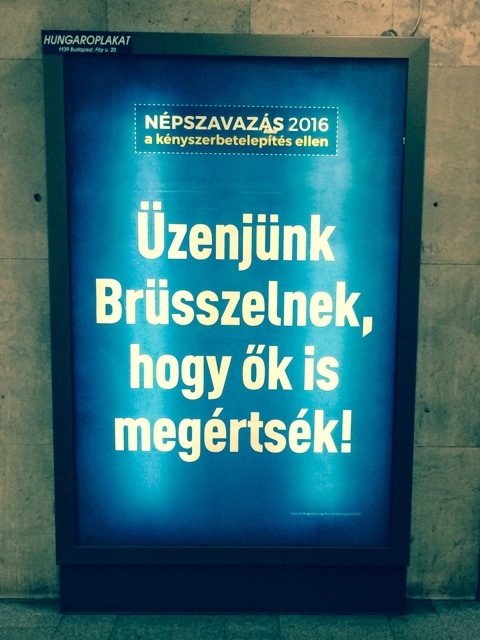 The Hungarian government will resign if the majority in the referendum says “yes”. There will be a demonstration for the future of our children on Saturday (totally unrelated with the referendum, right?). The opposition has been prohibited to gather on the Kossuth Lajos tér in front of the Parliament on the day of the referendum. Many of them don’t plan to participate in it, so it sounds like a good opportunity to go and have a little gathering in the city. This has been cancelled by the National Election Committee because it is taking place on the election day. It is already quite clear that the migrant redistribution according to the old plan of the EU is not working. The Czech Republic has accepted so far 12 people, Slovakia just 3. It does not seem to be a feasible plan which clearly undermines the value and the urgent nature of this referendum. I don’t want to draw conclusions about the correctness of the voting process and potential manipulations. However, I know one thing. If you don’t come to the election, then your vote cannot get manipulated. 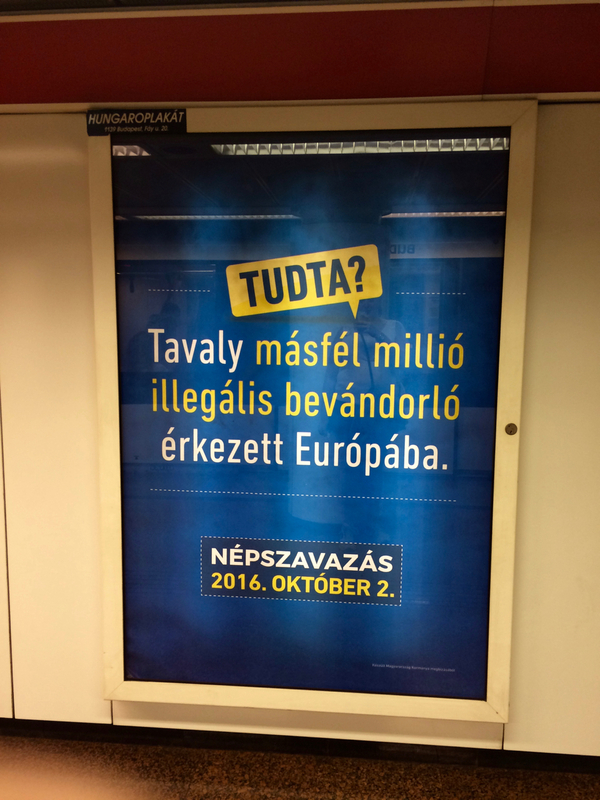 As I am not a Hungarian citizen, I cannot vote. But even if I would be able to vote, I would skip this plebiscite. The government did not persuade me that it has a go forward plan, plus the recent developments in the EU do not seem to be favouring the redistribution of migrants any more. Lastly, I am so happy it is over and I applaud to everybody living in Hungary who survived this sane. Let’s send a message to Brussels so they also get it! Did you know? Around one million immigrants want to come to Europe from Lybia. Did you know? Since the beginning of the immigration crisis, more than 300 people died in terrorist attacks in Europe. Did you know? Last year, 1.5 million illegal immigrants arrived to Europe. Did you know? 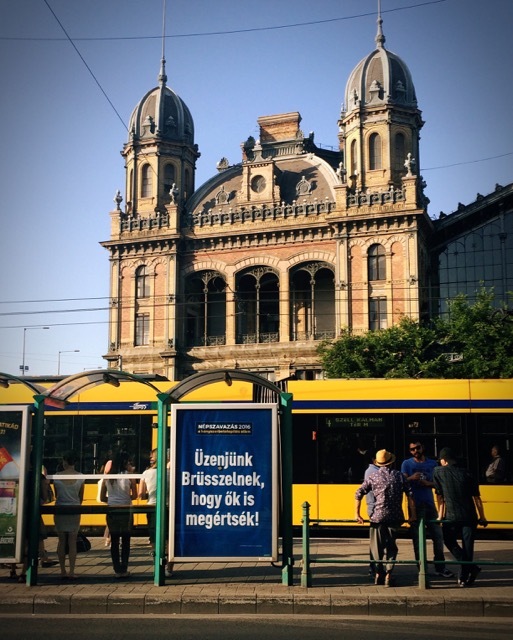 Not Brussels, not a city, not illegal immigrants, not want to be resettled to Hungary? 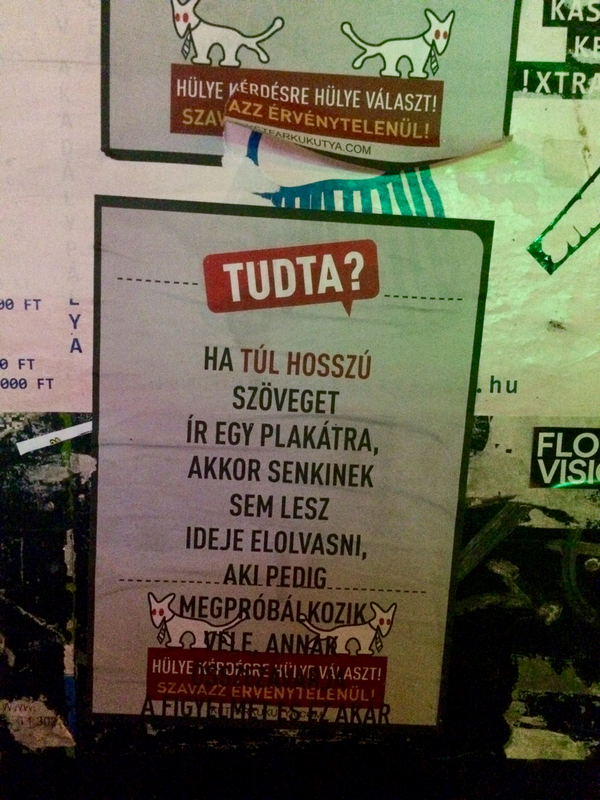 Ex PM Gyurcsány’s party campaign – stay home, stay in Europe. Did you know? 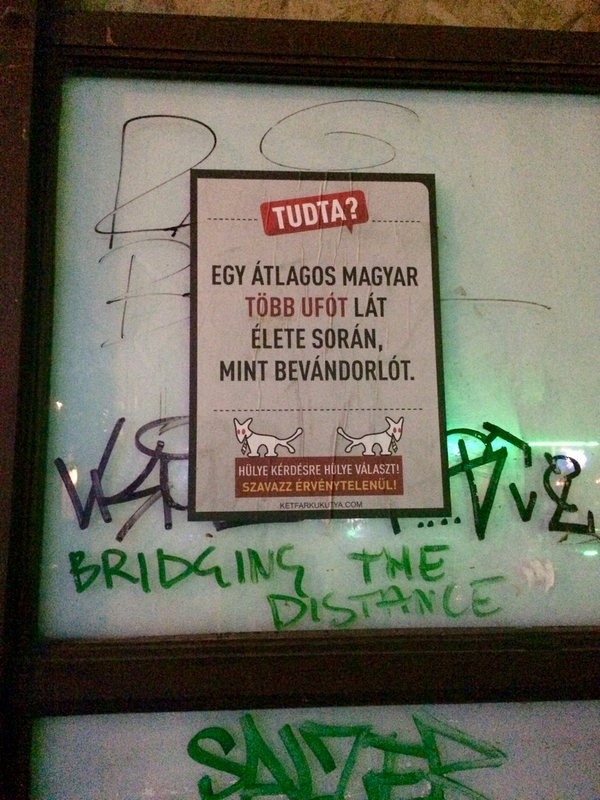 An average Hungarian sees in life more UFO than refugees. Did you know? There is a war in Syria. Did you know? The corruption crimes are committed mostly by the politicians. Did you know? 70 weasels can block an average canal. Stupid question, stupid vote. Vote invalid.